Five Michigan bands will record ArtPrize 2016 entries at Michigan House Austin, which will also serve as a gathering place for a discussion around the intersection of art and technology. GRAND RAPIDS, Michigan, March 3, 2016 – Michigan House, a roving pop-up space that is a touch/taste/feel testament to a thriving Michigan—together with ArtPrize, the radically open international art competition—today announced that the fourth iteration of Michigan House will serve as a home-away-from-home for Michigan music and a space for discussion around the intersection of art and technology during South by Southwest 2016 in Austin, Texas. 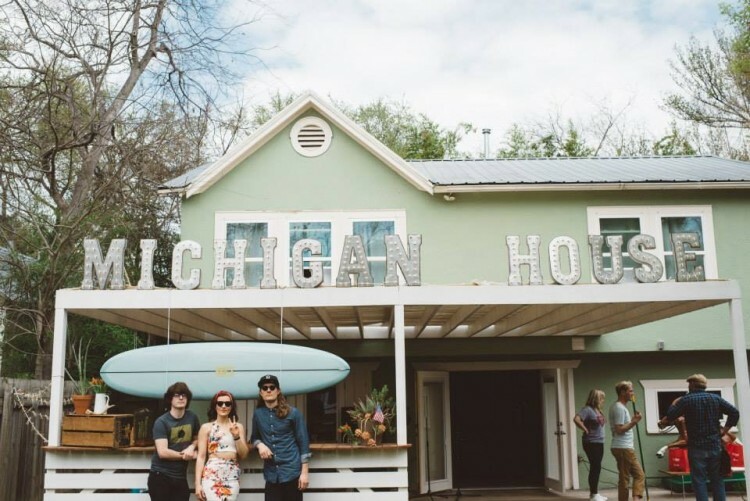 Michigan House -- slated to take over a house in East Austin from March 14–17 -- is teaming up with ArtPrize to provide a residency program to five Michigan musical acts that are making the trip to Austin later this month. Each day, a “House Band” will set the tone for Michigan-centric programming featuring the art, music, food, and creativity that powers this state. They will experience a healthy dose of midwestern hospitality, spending a day at Michigan House filled with food and drink imported from the mitten state, and relaxing on Michigan-designed furniture. One of these five will win $5,000 and the opportunity to headline the ArtPrize 2016 Opening Day ceremonies at Rosa Parks Circle this fall. The winning band - selected by a panel of music experts - will be announced this summer on an episode of Critical Discourse, the soon-to-launch web series presented by ArtPrize. ArtPrize Exhibitions Director will host a public conversation with Sarah Urist Green, creator and host of PBS Digital Studios’ The Art Assignment, on March 14 at 4:00 p.m. Like ArtPrize, The Art Assignment is a technology-drive art initiative based in the Midwest. During “ArtPrize and The Art Assignment: Using Technology to Build New Art Audiences,” Green will discuss how the show has tapped into the participatory creative communities of YouTube and Tumblr to build new audiences for contemporary art. Additionally, Critical Discourse will be covering Grand Rapids native Joel Potrykus’ SXSW 2016 involvement, including the world premiere of his feature film, The Alchemist Cookbook, and his SXSW Interactive panel with Grand Rapids-based Failure:Lab. Photo: The Bergamot outside Michigan House Austin in 2015.